First of all I would like to say I have always been very proud of our high school class and have enjoyed talking to many of you through the years. I miss the many who have passed on to the other side and look forward to seeing them again. I would also like to apologize for not communicating back to the well wishers when my birthday has rolled around. I have been involved in many things since high school but, the best thing that ever happened to me was meeting and marrying Tom Matthews little sister Susan Matthews and enjoying our kids and grandkids together. 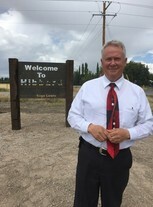 I have managed and owned several businesses and worked in car sales and at KIFI TV in Idaho Falls. I just left Taylor Chevrolet in Rexburg after 11 years in July of 2015. I have held many church callings and was just released as Bishop for the second time. First in Archer ward and this one at BYUI after being there for almost 6 years. I don't recognize half the people in my own ward. Now I just farm my 50 acres and help Susan with her flower business. My most recent thing was to fall on rocks while hiking and broke 4 ribs. I am still recuperating. Norman Erickson has a birthday today. Norman Erickson changed "Now" picture. Norman Erickson changed profile picture. Norman Erickson added a comment on Profile. Norman Erickson added a comment on Profile. New comment added. Norman Erickson updated profile. View.